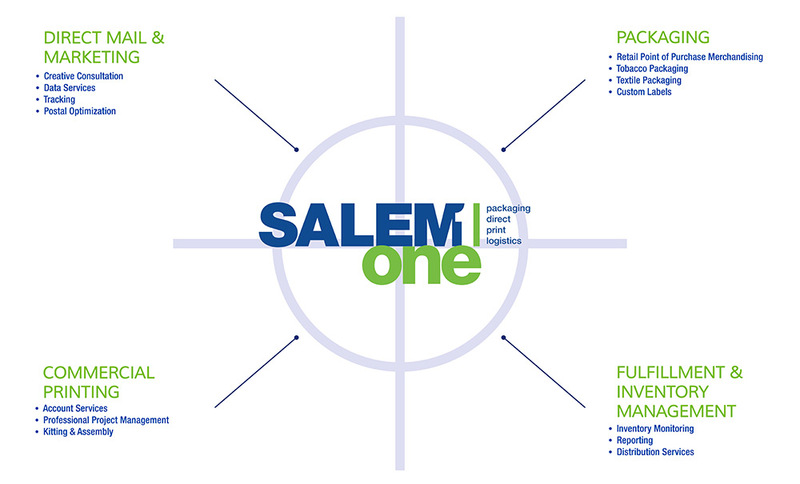 Salem One has evolved into one of the largest and fastest growing Packaging, Print, Direct Marketing and Logistics companies in the Southeast. We produce award-winning work and improve business results for leading regional and national corporations and brands. While our growth has been tremendous, it has been based on a singular objective and understanding. Salem One is more than a printer. We offer a combination of proven capabilities, a service commitment and solutions focus-like no other. We understand that in order to be successful, our clients must be successful. Therefore our objective is to deliver Simply the Best products and services available to our clients. Our client base includes major national brands and markets and we will continue to produce award-winning results in support of these corporations by being Simply the Best in our industry! Salem One offers a complete selection of printing, packaging, and direct mail options, plus a team of the most experienced project managers and production experts in the industry who have a keen eye for quality and a passion for perfection. The world of packaging, marketing, print and communication is ever-evolving and we are excited about the new technology that links these areas of expertise. That is why our organization has grown to be the region’s leader in providing relevant print, communication, and logistics solutions. Our team earns trust by getting to know clients and their specific business needs. We build strategic relationships through collaboration and understand that each day we must deliver greater value than we did the day before. That is why we have embraced new technologies and are dedicated to “Connecting Print” for our clients like never before. Our promise is to deliver results to your entire print logistics supply chain with speed, quality and service that cannot be surpassed.